Andi B. Goode: Is it a dress...? On Wednesday I found the most amazing thing that I have come across in quite some time. 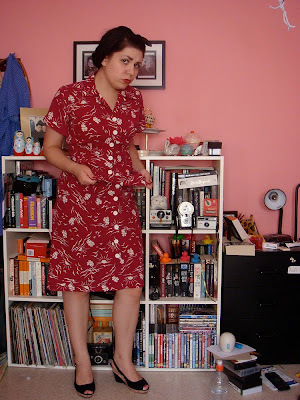 Is that a cute 1940s dress I see? And I can't remember where I saved this from but it's pretty much the same thing as mine. I just love these little playsuits with matching skirts. They're quite versatile! Honestly, you could have knocked me over with a feather when I saw this hanging up on the door of a shop I went into with my dad. 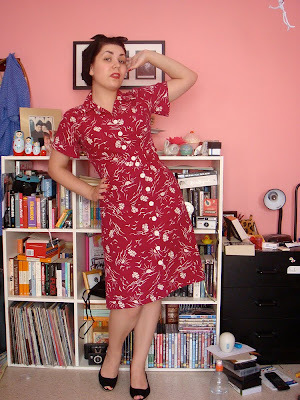 The tag says 'A Tom Boy Fashion' and it's by 'Racketeer' but I could find out anything about the label. The only other information on the tag is that it comes from the United States. If anyone else has something by the same label, I'd love to know about it! Also, I just realised that the Thoroughly Modern Millie edition of Silver Screen Sunday marked my 100th post! Hup! Hup! Huzzah! P.S. 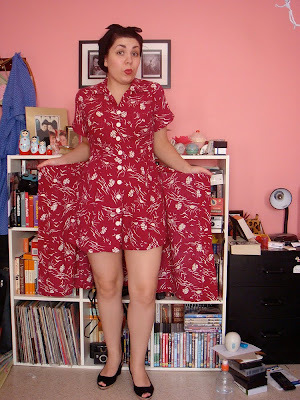 Forgive the silly photos - I was so happy about my playsuit that I was in rather a silly mood - and messy background. How cute, i havent seen anything like it before! The photos are fun too, like how you did this post. so awesome. love the red & the skirt/shorts idea! How cute and I really like both ways to wear it as a dress and playsuit perfect for a day at the beach. So jealous! Those are adorable, what a great find! I have always wanted a playsuit! You are a very lucky girl. And it fits you so well! Love it! That is so adorable! I want to find one! Wow! What a find! I would have squealed so loud if I had of come across something like this!!! oh i love it!!! so lovely! Stein doll: Yes, it's great! Thanks. The Girl Can't Help It: Thank-you. Amanda: Thank-you. I hope you do! Ms. B: I'm surprised I didn't squeal! Ooh, super cute! I need one immediately! Antonia: Thanks. I just love it! OH! Lucky you! It's so cute! Oh my gosh! I'm so incredibly jealous, that's an amazing find! I love the versatility of the outfit - lucky you! Wow that really is genius. Such a good find. And it fits great!! You always find such amazing stuff. I never have the time to trawl around Melbourne for these things. So I make do with trawling around Etsy. So pretty! You look very cute wearing that. 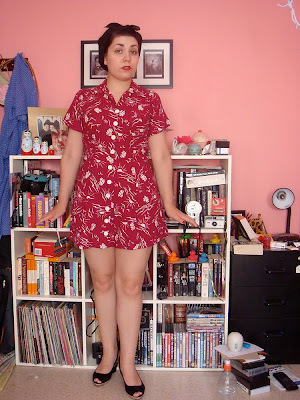 I want a playsuit with matching skirt so badly now. That dress/playsuit is the cutest thing ever! I'm so jealous! What a lucky find doll! It is just adorable! That is the cutest thing I've seen all week. I'm so jealous of your find! That's darling!! My grandma told me about a road trip when she was a little girl. She said that back then, ladies (and even little girls) were NEVER seen in public in shorts. At least, according to my great grandmother! They went on a road trip in the summer and the boys were allowed to wear shorts so my great grandmother allowed herself and my grandma to wear shorts in the car. 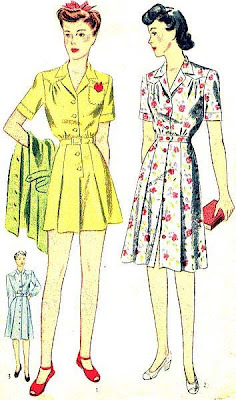 But anytime they stopped even just for gas or a restroom pit-stop, my grandma and her mother put on matching skirts that great grandma had made to cover up the shorts! Oh, how scandalous!! Really adorable - and it looks great on you! Oh wow, awesome! I've got a book with some pics of something v similar, and they all it a dido! Yours is amazing!